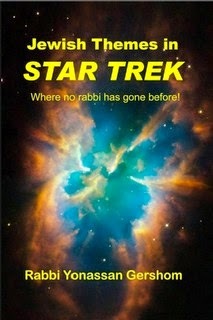 Are Spock's ears stand-ins for "big Jewish noses"? Is Worf really a Klingon version of a ba'al tshuvah? Plus: I have proof positive that the Ferengi were based on Yankee traders, not the Jews! I spent over 15 years working on this project. Rumors of this book were around for five years -- that's the time my agent and I spent being told that there is no market for it. What??? With millions of Jews and millions more Trekkers (and a lot of people who are both! ), they've got to be kidding! No market? Then again, publishers are notorious for turning down good books. (The Wizard of Oz was rejected with "we don't need any new fairy tales." Go figure.) So, I decided to self-publish it on lulu.com. They print to order and the quality is very nice. One interesting bit of personal trivia: When I went to the NASA site to find a cover image, I looked through lot of Hubble shots of planets, galaxies, nebulae etc. until I found the one I liked. Only then did I look at the name of it -- Nebula NGC1818 -- double chai! Is there a better sign that the time is right for this book? You can download a FREE copy of my desktop graphic of the original Enterprise flying through Nebula NGC1818 -- just go to this page on box.net.